shades I got Poe, a metallic navy blue and Lullabye, a Metalic magenta/violet shade. These are replacing the old range of metallics from Kat Von D for Sephora. As the waves of odd/edgy shades of lipsticks keep coming out and doing wonderfully from brands like Melt, Lime Crime and OCC Makeup, it's no shock that more interesting shades like these along with Slayer and Coven (not owned yet) are included in the artistic line. 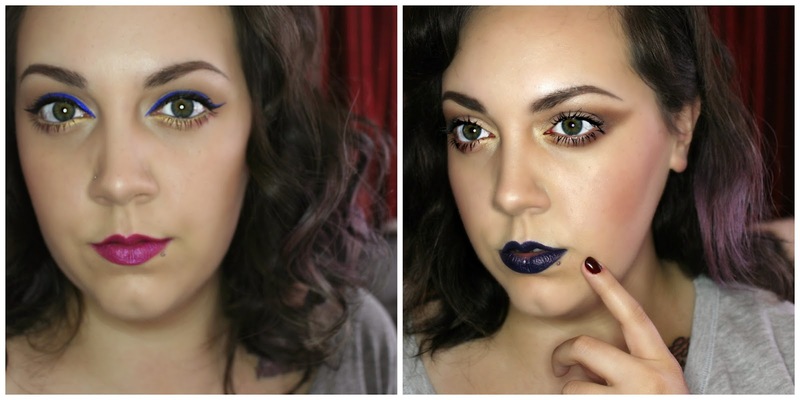 I chose to wear Lullabye with other pops of color on the eyes and I did Poe with an edgier eye, but at the same time more subtle as the lips are enough of a statement. Both of these shades are very well pigmented and I'm quite pleased with how smooth and evenly Poe spreads on the lips since some ultra dark shades can look a little patchy or or so thick they're hard to spread on the lips. Out of the two, Poe is my favorite. I have, not have I seen anything like it before. I am so glad I got some metallics from the range and I see myself getting more. Can you say makeup hoarder? No, let's go this collector. Yes. That sounds nicer, doesn't it? I hope this has been a fun read and a nice pop of color in your day. Would you wear these shades? Let me know in the comments what shade you're lusting after form Kat Von D. For more from me follow my Twitter, Instagram and Tumblr. Thanks for reading and have a beautiful day!